He's very much your usual Pansy in some ways, protective and kindly and polite, but in some ways… Not so much. He's a bit of a space case, to be honest. No, literally. While he spends most of his time being fairly quiet and helping others, if you happen to bring up his favorite subject of science fiction, he'll suddenly open up with a new brightness in his eyes and liveliness behind his voice. Sure, he's a bit obsessed with spaceships and time travel and mad scientist hijinks, his favourite question "but what if?! ", but he's more adorable than annoying, truly. He's just so happy when he's in his element. Indigo is spotted like a cheetah with richer purple on his rubbery skin, except his spots aren't round and he doesn't very much look like any lithe feline in body type. Triangles are what pattern him, mostly isosceles, a few right scattered around, one or two equilaterals hiding in the bunch, none of them very large but enough of them to cover half his body probably. He's a smidge on the short side, a smidge more stocky and slow than some of the competition in his rank. Soft wispy blue like the distant atmosphere provides an attractive contrast to his body where his tail and mane come into play. Come, T’Rae! We set off for the great unknown, for it shall not remain unknown for long! Oh, you wanted a few moments to yourself? The planet’s too big to stay in one place for too long. This Gladiolus lives life from moment to moment, never dwelling on one thing for long. Very rarely will you find him anything but upbeat and optimistic, in constant awe of the world around him. Even in his pursuit of knowledge, he seems to take more pleasure in momentary observations than in knowing every little thing about what he’s looking at. He’s got a bit of a silver tongue that he finds no shame in using, and he isn’t above his charm and wit to get just what he wants from you. Beware any adventures he tries to talk you into though , before you know it, that “short hike” he wanted to take you on might just turn into a three month long expedition to see with his own eyes what lays beyond the Weyrd’s borders. After all, success lies in your collected experiences, does it not? Navun’s hide certainly befits his personality as much as it fits his rank. His whole body is hotrod red, splotched all over with darker spots of rosewood that spread all the way up his neck and across his nose and around his vibrant orange eyes. His mane and tail are kept at a manageable length, as best as he can with how fast it grows, and is colored tangerine, shot through with faded amber. He’s average-sized for a Gladiolus, but don’t think he doesn’t know how to throw himself around if he needs to. If there is a Kachir among this group that is more refined and proper than the Gladiolus, it’s this Freesia. She’s graceful and cultured and very knowledgeable in all sorts of social circles. She’s the sort of shoulder you can cry on—if you haven’t upset her recently, that is—and she certainly has a way with words. She can calm the most troubled of hearts and sway stubborn minds. She’s not afraid to use her feminine whiles to get what she wants, but she does it in the most classy way possible. She wants everyone to be happy, really, as that is her goal in life. If you’re not happy, she’s not doing her job right, and she’ll fix it. She enjoys tea and will often sit you down with some to talk about whatever is on your mind. While she has a pretty tough skin, she can be insulted if someone she loves slights her, so be careful not to dismiss this Kachir’s worth. She’s prone to trying to hide embarrassing situations, but she doesn’t really get into many, so that hopefully won’t be an issue between her and her bonded very often. She also is very independent. If she's made up her mind, don't try and make her decisions for her or you'll end up with one very cross pony! She’s a stunning little pony, coming in a rich purple shade and goldenrod. Her hide is mostly purple except for a diamond of goldenrod on her forehead and where her nose had been dipped in it, fading up towards her golden colored eyes. 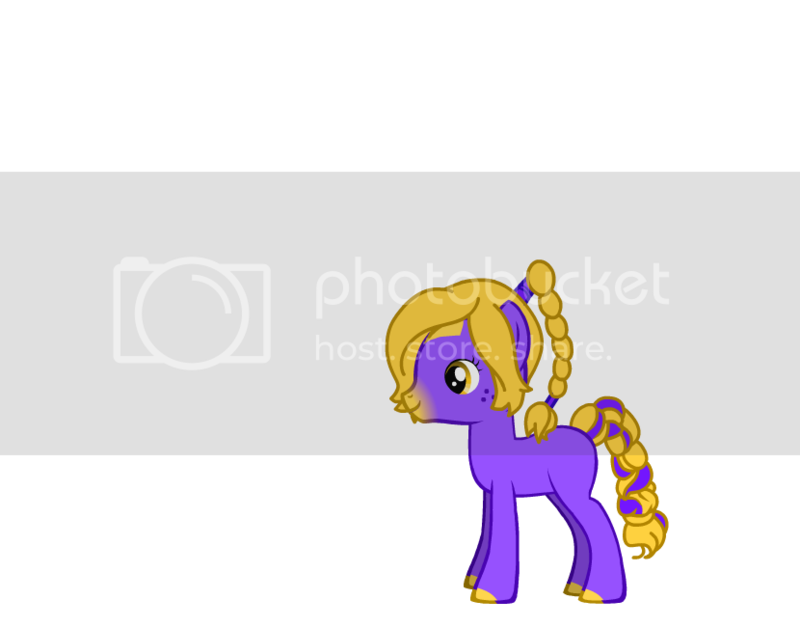 Her mane is merely goldenrod, though it’s done elaborately up in a braid tied with purple bands. Her hair will require a lot of attention, but she leaves no detail untouched, so her bonded better know how to braid or they’re going to have to learn! Her tail is also braided, but comes in streaks of goldenrod and purple. And oh yes, can’t forget the golden hooftips. Believe me, she’d wear beautiful shoes if she could! Its rather odd, how bright and upbeat this Freesia is with how much time she spends thinking on everything that she can. She sure is a thinker, but she takes a good view out of everything she has mulled over. And don't think that this Kachir over thinks things; oh no. She just likes to take in as much information, contemplate all the different angles and at least give things some thought before making any sort of opinion or decision. She is wonderful help with decision making, giving you a list of pros and cons and what you should be aware of and what you can ignore to give you the best end result you can get. Don't mistake this Freesia as smart, however; if you asked her the mass of the sun she'd just laugh at you and point you in the direction of the nearest Imp familiar. Oh no, she's not book smart. She's just a good thinker. And also very modest. The Muse of Thought is a nice swirl of pale yellow and soft lilac, mixing in circular patterns evenly across her body. Sharp streaks of bright yellow and saturated purple make an appearance every now and then, like a burst of clarity in a fog of obscured details. Her mane and tail are a good balance of the same muted colors in her hide, and are best shown off, the Freesia has found, when they are braided. Lastly, the Thought's eyes are split; the left is a stark purple, while the right is more muted. In comparison to her more bubbly Freesia sisters, this one seems almost somber. She’s not really—she’s a happy creature, content with life and eager for the day—but she goes through it all in a much more subdued manner. She doesn’t speak up a whole lot, and when she does it’s often a response to orders—which usually consists of a ‘yes, sir.’ You see, she’s very loyal and obedient. She’ll tell you what she thinks if she disagrees with you, but she’ll ultimately follow her bonded into any decision they make. If you’re going to go on a suicide mission, she probably won’t like it, but she’ll go and do all you ask. She doesn’t want anything to happen to those she loves, and if something did happen she would surely try to rectify this injustice. It’s hard for her to accept when people die, but who can blame her? Wouldn’t life be so much more beautiful if no one could die? She’d also probably love to be a mother but understands this cannot be so and accepts it with a silent sort of resignation. Much like her personality is very different from that of her sisters, her appearance is also dramatically different. The only thing purple about her is her vibrant eyes! Her hide is a pale sunshine yellow with a slightly darker yellow appaloosa spotting on her rump, and ending her hooves. Her mane flows in streaks of the same colors. Her tail is quite the site, though, completely frizzy and impossible to manage. It would take hours to tame the frizz, and frankly, who has time? It’s cute on her, at least. She’s hardly self-conscious about it, though, so don’t worry about it. The smallest of the bunch, this Tiger Lily doesn’t stand out all that much when compared to her siblings. Her hide is a deep, dark orange, looking almost brown in places, with no markings of any kind. Even her mane and tail are dark, being a muddy reddish-orange that only becomes bright until direct sunlight. She’s thin but not frail, and not that fit due to pursing indoor activities rather being outside. It’s not that she hates being outside, but conditions have to be nearly perfect to get her out on anything longer than a short walk. Assuming you don’t drag her outside, that is. The reason she prefers being indoor is simple: that’s where her beloved books are. Fiction, non-fiction, history, horror, scientific treatises…she’ll read them all with pleasure. Talking isn’t her strong point, unless the topic is about books of some kind. Then she’ll gladly ramble on for hours about what she has read, and how a certain book compares to another book in the same genre, and so on and so forth. Otherwise, she prefers to watch and listen, soaking up information that way. She's a bright girl, like almost all Kachir are, but she seems to have a more firm grasp of her sanity than some others. She's kind, but maybe a little awkward, and seems to really just want everyone to find some happiness in life. She knows all sorts of ways of bringing up someone's mood, and has made it her life's goal of learning all about how emotions work and how to bring out the best in people. Sure, it might end up looking a bit awkward — she sometimes doesn't quite know how to approach an upset person, or how to offer them a gift, or what the best words of encouragement are. But she is eager to try, and she will figure out how to get better as she goes. The more she works the less awkward she will be with those that she is close to. And it really is obvious that she is trying to please everyone; her awkward attempts are sweet, and she is incredibly determined. She might not understand, and she might be confused, but she promises she'll do anything to make you smile. Everyone has bad days, that she knows. And she knows how frustrating and depressing those types of days can be. She wants to help, she will help, and before you even know it, those dark clouds are going to disappear and there will be smiles and sunshine all around. Sure, this might be a little ways away from normal…she's heard often how her intelligence could be put towards more practical things, but this makes her happy. And she feels like it truly tests her intelligence when it comes to emotions and helping people. She's not about to let anyone ever get her down about her life choices. She's well built and on the large side for her rank, all sleek muscle and strength. 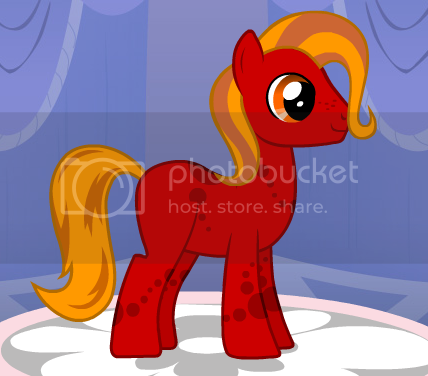 Her mane and tail are the color of rust, mixed with the occasional black strand of hair. She's rather on the dark side all around; her hide is a dark burnt orange with specks of black over her haunches and belly. A stripe of pale peach runs down her nose and over her lips, while there's another splotch of peach in the middle of her chest. She might not be small and dainty, but hey, it means she's perfect to lean against and hug if you need it. She counts that as a win in her book. Being of medium size for one of her rank, her hide is a lovely shade of orange, bright enough to be easily noticeable but without being too glaring. Scattered all over her body are tiny black stripes, although they aren’t that visible from a distance. Her mane and tail are just a shade lighter than her body and bear the same black stripe pattern, except here they are larger and thus can be seen easier. This Tiger Lily loves a good debate and will do everything in her power to get one going. The topic doesn’t matter - she figures she’s smart enough to debate almost anything, and besides, isn’t the point of a debate to decide where one opinion lies on the issue at hand? She likes to win of course, but she’s not a sore loser by any means. Outside of debating, she’s a talkative one, eternally asking questions about everything under the sun. Sometimes her questions get her into trouble, but she doesn’t care. Information is power, and she wants all the information she can get! Whereas her Tiger Lily sibling tends towards darker, dimmer shades, this Tiger Lily — clearly the shortest and overall smallest of the bunch — from the opposite end, her base coat a bright, light amber, with only a few small black splotches on her rump and a smattering of freckles on her nose. Her mane grows straight to a medium length, coloured in ribbons of light orangish brown and reddish rosewood, instead of proper darker orange and red, and her long, wavy tail is also marked by streaks of these two colors. The aforementioned mane has a tendency on its own to grow over to one side, a tendency she encourages, leaving her with a curtain of hair on one side of her face. Her eyes are also the brightest of the four, very pale yellow, and she often sports a slightly nervous grin. A bit of the odd one out, she's not particularly bold, nor quite as forthright as the others. She's a little bit calmer for one thing, and might almost be mistaken for relaxed if not for the shyness in her smile and her tendency for fidgeting in place. For another, though she's definitely a bright little darling, she doesn't seem to have quite figured out who she is for herself and she hates to admit when she needs help, or when she doesn't know the answer. The thing is, she doesn't, well, she doesn't know what her specialty is yet, and it's left her with a lack of self-confidence and an excess of self-doubt. In spite of this, she's perhaps the friendliest, sweetest of the bunch, a little overeager in fact to about and prove she's intelligent and hopeful at all that, and when she's comfortable around you, she'll happily nerd out over pretty much anything, really, she just likes everything so much in general it's hard to pick anything specific the focus on. It just might take her longer than a lot of other shinies to feel really comfortable sharing honestly about herself with anyone else. It's clear she has all the potential the world, brimming with hope and optimism; all she needs is somebody to help her actualize all of it. This Zinnia is a genius, he knows anything and everything that goes on, he lives vicariously through the lives of others while hermiting himself in such a way that very, very few people even know he exists. And even though people rarely see him. He tolerates T’Rae in exchange for the technology that she has to offer, otherwise he wouldn’t even want to be anywhere near her. With certain amounts of OCD and paranoia he’s well off enough to hold up an appearance in public, assuming that social contact only comes in small bursts. He’d rather spend all his time and effort with computers and information. And oh can he get information. His set up is so expansive and so powerful that it wouldn’t be hard to believe that it would go on forever and the Zinnia knows everything. That’s the exchange, T’Rae leaves him alone and he does anything and everything she asks from her technology without any fuss. They don’t see each other for the most part though, and arrangement that works pretty well for the most of them. 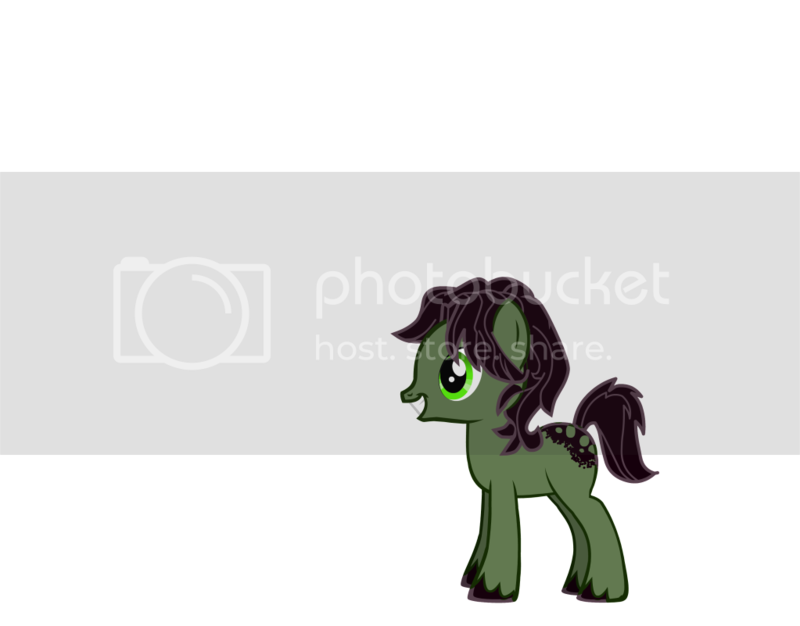 Just like any other Zinnia he’s a drab cactus green for most of his body, with a simple brown mane that’s whole lot curlier than you would expect. He’s a wimp, there’s no mistaking it, he wouldn’t fight anything though he does seem to have a mild preference for violence in general despite never causing it himself. It’s his eyes that really stand out, a very bright radioactive green that you would swear up and down glow in the dark.